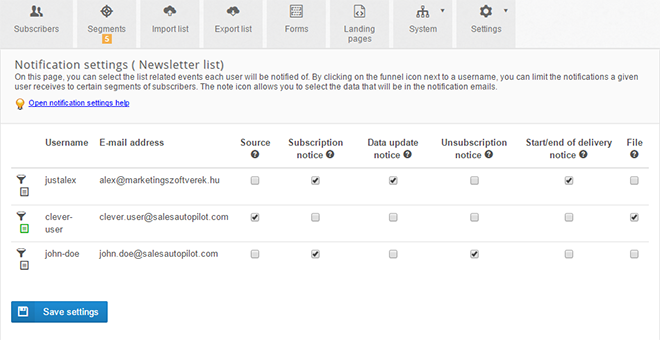 With SalesAutopilot, you can send notifications to certain users whenever there is a subscription or data update. To set this up, click on the name of any list, click on the ‘Settings’ tab, and open ‘Notifications’. 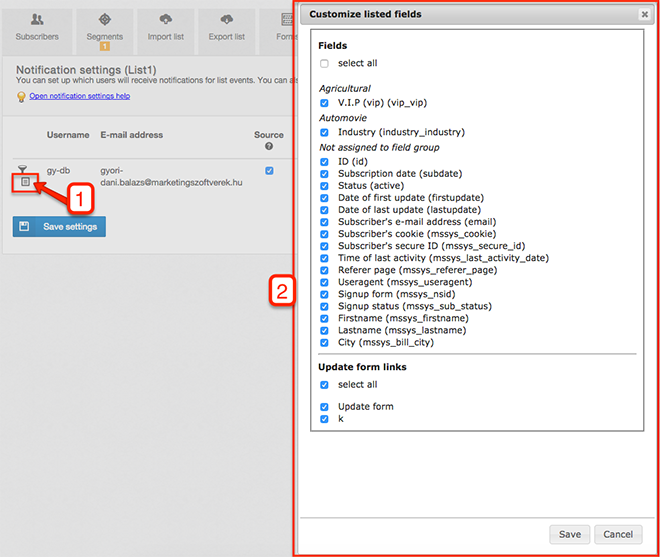 Subscription notice:sent to the selected user(s) whenever someone signs up to the email / order list. Data update notice:sent to the selected user(s) whenever someone unsubscribes from the list. Start/End of delivery notice:sent to the selected user(s), whenever an absolute delivery schedule starts or stops sending emails to the subscribers of the list. File:You can add an upload file field on signup or update forms. If, for example, a translation agency uses SalesAutopilot for colletcting RFQs (Request For Quotation), this field would allow the person requesting the quotation to upload the file they would like to have translated. IMPORTANT:When the list is created, all of the notifications are automatically selected for the user who created the list. However, you can unselect any of them, or even turn off all six. You can access the Notification settings page by clicking on the Settings tab of the given list, and then selecting Notifications from the dropdown menu. Select the type of notification(s) you would like each user to receive, and then click the ‘Save settings’ button. You are able to customize the fields, data update form links, and landing page links each user will see (for the given list) in the notifications. To access these settings, click on the  icon by the user’s name. In the popup window, you can select the fields, data update form links, and landing page links you would like to see in the notification email(s). If you choose the ‘select all’ option, then all the fields will be selected or unselected. You can find the same option for the update form links and the landing page links. If you’ve made all the desired changes, click on save, and the window will close. The icon by the email address of the user will turn green, .You can change the fields and links you have selected at any time in the future. If you would like to notify certain users of the subscriptions, or data updates of only a certain segment of subscribers, click on the  icon by the name of the user. In the dialog box, select the segment(s) the subscribers have to belong to for the given user to receive notifications about them. When you are done with these settings, click on the Save button. The funnel icon by the name of the user will turn green, , signifying that they will receive notifications through filtering. If you would no longer like to use a filtering, click on the  icon, uncheck the boxes next to all of the segments, then click on the Save button. The grey  icon will appear next to the name of the user, signifying that the user will receive notifications about every subscriber (of course, only if you have selected any notifications).